Kheer is a Indian pudding made from rice, milk, sugar and nuts, flavored with cardamom. more flavorful we can add saffron. It is typically served during a meal or as a dessert. 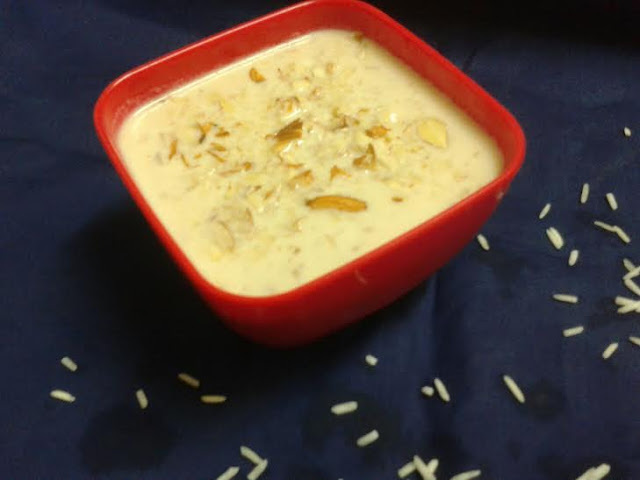 Kheer is prepared in festivals, It is also known in some regions as payasam, payas and firni. 1 Tbsp chopped nuts for garnishing. Wash and soak the rice for 1/2 hour. soak the saffron in 1 tbsp Luke warm milk. Heat the ghee in a pan and fry the rice for 2-3 minutes. Boil the milk in a heavy bottom pan, After a boil add soaked rice, stir continuously and cook until it's becomes medium thick. It will take approximately 20 to 25 minutes on low heat. Mixture become very thick when it cools, so keep medium thick consistency. Now add chopped nuts, sugar, cardamom powder and saffron. Mix well and cook for 2-3 minutes more then switch off the gas. Dish out the kheer and refrigerate.